Visual pollution is a term used to describe all of the visible deterioration to landscapes and living environments, from plastic bags hanging in trees to high voltage lines. Although tougher waste regulations have significantly reduced visible waste pollution in Europe, the question of pollution caused by infrastructure and advertising is more complicated. Infrastructure such as bridges, high voltage power lines or motorways are often declared to be for the public benefit, and their creation prevails over other considerations, such as the preservation of landscapes. In addition, the high cost of alternatives (burying, tunnels, etc.) generally discourages use of alternative methods. However, procedures for heritage classification, measures taken to 'blend' infrastructure into the environment, and public inquiries help reduce, to a certain extent, the visual impact of this infrastructure. When it comes to advertising, the constraints are lesser and some places are significantly impacted by an accumulation of signs and billboards, which sometimes generate light pollution. 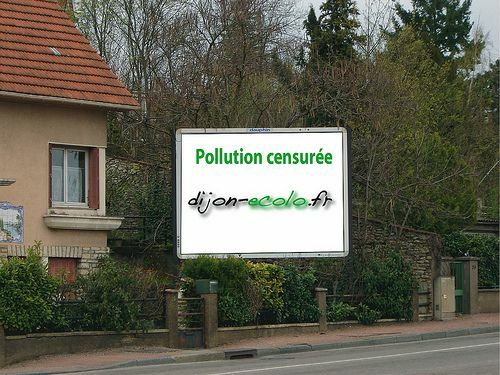 In fact, the French 29 December 1979 Act on advertising, signs and sign-boards is rarely applied, except for sites under heritage protection laws and the districts around natural parks. This has led to several campaigns for the protection of landscapes, living environments and natural environments to focus on the visual pollution caused by advertising. The Grenelle 2 environmental round table thus considered the possibility of amending this Act.